Our very own beach… when the tide comes in. Last week I planned another camping trip not knowing that it would be the last camping trip Mark and I would take in Thailand. From reading other people’s travel blogs, I saw that we would most likely be the only people camping there, the bungalows are expensive, and transportation might be a hassle. I decided the best camping spot for us was Laem Sala Beach since it was near a restaurant and a cave. There was also another cave within walking distance and a small village between the beach and the other cave where you can get a ride back to Pranburi. John told the cab driver where we wanted to go, but the driver just did his own damn thing and dropped us off where he felt like. We were there for about 4 hours before we realized that we weren’t where we thought we were. We asked the park workers for directions. We were really confused when they said the cave, that was supposed to be right there, was 17 km away. 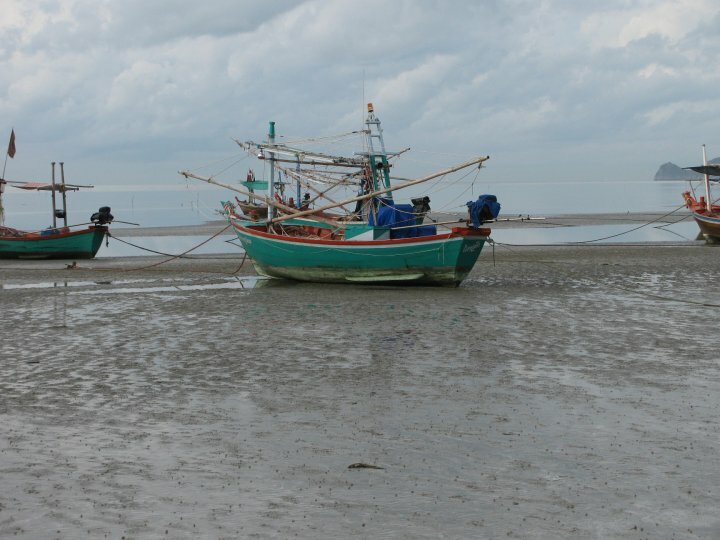 We were actually at Sam Phraya Beach, which also has a restaurant but not much else. This park, whose name translates to 300 peak mountain, has hundreds of caves, or at least that is what the people at the park said. I became a little suspicious of their definition of the word “cave” when I came across a tiny indent in some rocks on the beach that they claimed was the cave on this beach. Well, I guess it was a cave, just not a very spectacular one; not worth coming all the way from Bangkok for. Since there were no real caves near our beach to explore we went for a walk around to see what it did have. We walked to the next beach, the one in the picture above. In the photo the tide is out leaving mud that had been drying all day making it easy to walk on. By the time we passed this way again to get back to our camp, the tide was up to my knees and the hard surface turned into sinking mud which made it very difficult to walk. I almost lost my shoe a couple of times in the mud. When you watch the video below that Mark made, there is a part where I’m bending over. I look like I’m playing in the water, but I’m actually pulling my foot out of the mud so I can take the next step. The tide came in very quickly. I’m used to the tide coming in subtly so that you don’t even notice. But it rushed in. You can see it in the video when John does his “Moses” thing. Okay, it’s not like a tidal wave; more like filling a bath tub with water. The next day we were able to talk the park workers into renting us their scooters for way more than the bikes were worth. 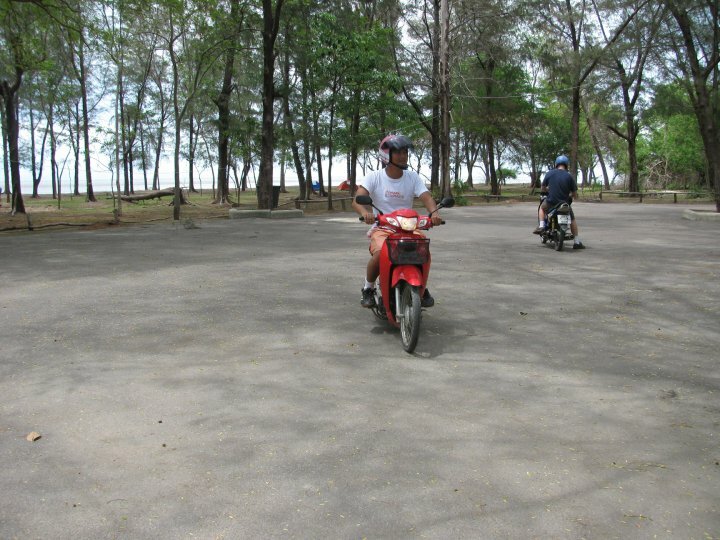 Now you might remember my vow in Laos never to get on one of these two-wheeled devils again. But hitchhiking was not an option here. There are very few cars driving around the park; it’s 80% scooters. I tried it out anyway. I got on and started the thing up and off I went. But when I squeezed the breaks, the scooter would not stop. 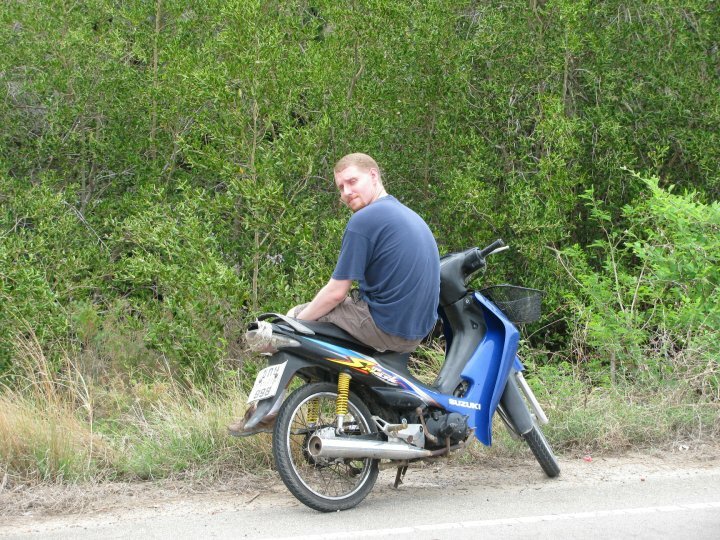 I wasn’t going very fast and just stopped the bike by dragging my feet on the ground. I got off and made up my mind that I would not get back on. Then one of the ladies offered to take me to the cave and pick me up again at 4:00pm. I was cool with that; she seemed to know what she was doing, and her kid who also rode along with us on the same bike, seemed to trust her. …by the way. It turned out that the real breaks was in the form of a foot pedal. But I just knew that I would have confused it with either the foot rest or the other foot-pedal used to change gears. I still think the key to conquering the world is automatic transmission. Americans have it. What’s wrong with you, rest of the world? It turned out that it was a good thing I was such a baby. The scooter I was being driven on, ran out of gas. At the time I didn’t know why we stopped. I looked to John to do some translating but he wasn’t there. He had stopped several meters back because his tire was completely flat. We waited on the side of the road for about an hour for the lady to get gas and change the tire. I’m sure, had we been on our own, we would have figured something out. But it is always easier to have someone else do things for you than to do it yourself. 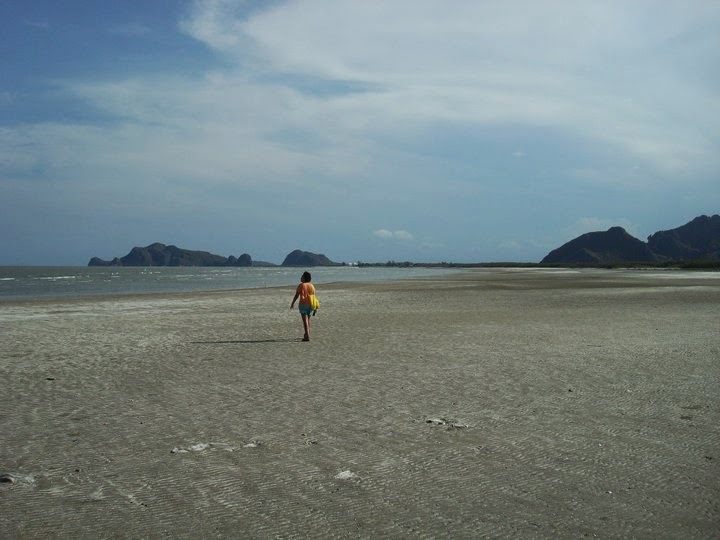 We did make it to the Laem Sala Beach, the beach I wanted to be in the first place. It was nice; almost as lonely as our camp. It would have been isolated, but the cave attracted visitors. I imagine that by night the tourists would have all gone home. 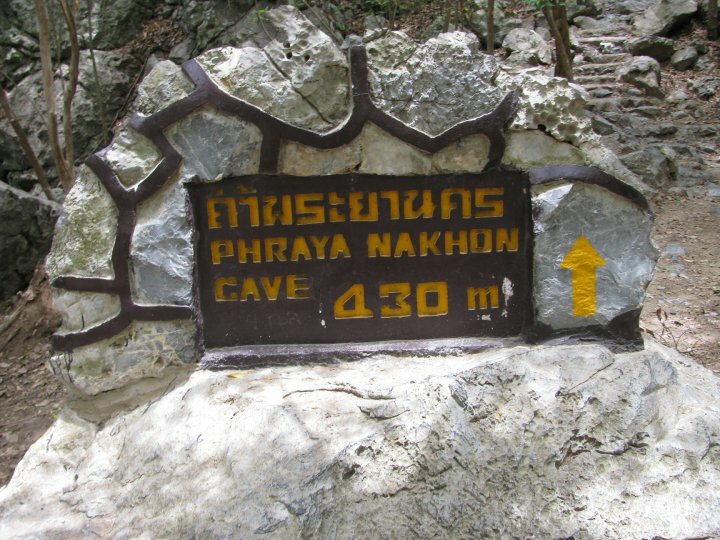 We climbed up to Phraya Nakhon cave and back down again. This cave is best seen on a sunny day. There was a sinkhole that fell through the cave allowing light to shine in. 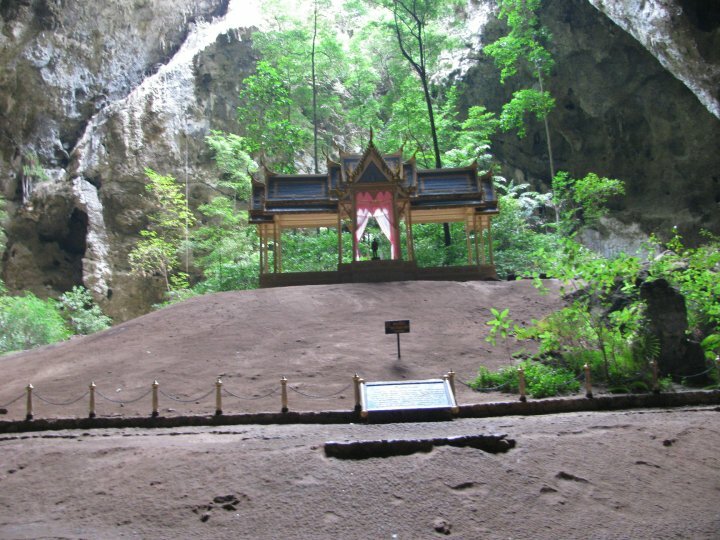 There is a shrine to some king of Thailand who visited the cave a few times, though I have a hard time believing that a king climbed that mountain. Maybe he was carried on a sedan chair. King What’s-his-face visited here once. After this cave, Mark and John went to see Sai Cave. I couldn’t go because I was a baby and refused to drive a non-automatic scooter (of death). I waited for the nice lady to come back to the cave while the boys drove off. I ate a bowl of soup while waiting for my ride and thought about how great it was to go on a trip in a third world country and not have a scooter accident. We decided to stay another night. Things in Bangkok were getting a little crazy with rioting and staying just seemed like a better idea. Besides, Mark wanted to make a bigger fire than the one we made the night before. I wanted to do some night swimming. I LOVE night swimming! The night swimming was great. There isn’t a lot of light, but there isn’t a lot of water either. Okay, there was no swimming. It was more like 3 adults sitting in a large non-hot, salty, hot tub with waves and stars. Can life get any better? Take a taxi to Southern Bus Terminal and buy tickets for Pranburi (ปราณบุรี). There is also a van that goes between Victory Monument and Pranburi, but I hate vans. Van drivers drive like demons and I would rather not die with insufficient leg room. There is supposed to be a songtow that will take you to the village of Ban Bang Pu inside the park. 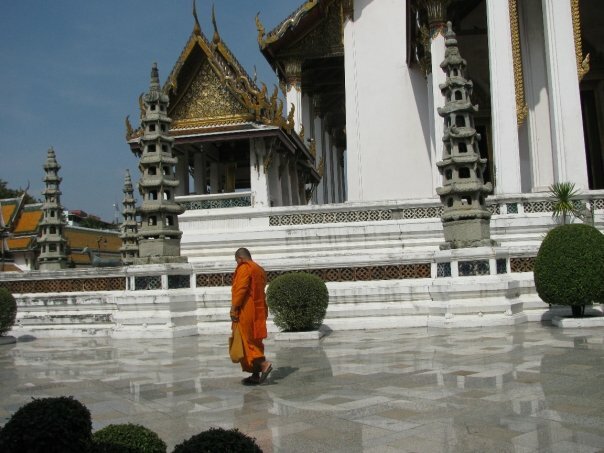 According to The Lonely Planet the songtow will cost 100THB per person. After you get to the village you can walk, up one side and then down the other side of a rugged hill, to the beach and camp site of Laem Sala. It’s not an easy walk when carrying tons of camping gear. There is another option of paying 250THB for a boat ride around the hill. There are many campsites, but unless you have a car or a scooter, most of them are hard to reach. 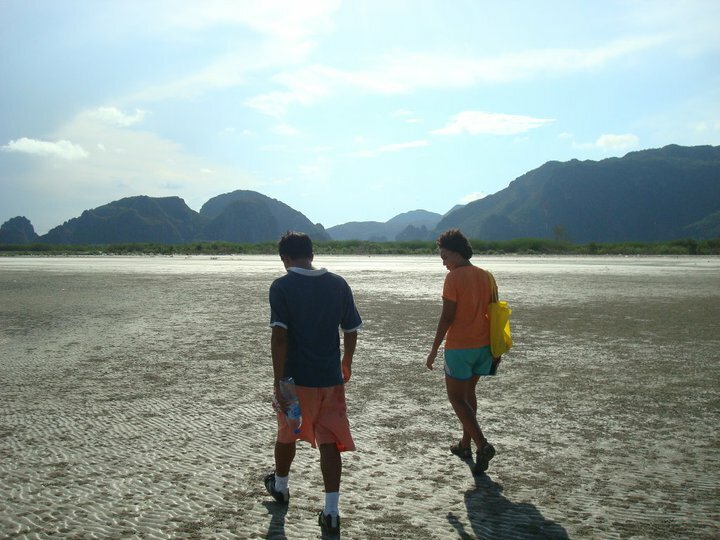 We took a cab to Sam Phraya Beach, but I recommend Laem Sala Beach for those with no transportation of their own. This park is cheaper than most parks in Thailand. It’s 200THB for foreign adults. Camping: It costs 30THB per night per person if anyone actually gets around to charging you. Bungalows: There are bungalows to rent. You can check the park’s website or call for more information. Though there isn’t much in the way of transportation inside the park, you might be able to talk some of the park staff at your camp into renting you their scooters. Be aware that their personal scooters will mostly likely be switch manual scooters. You will have to know when to change gears.